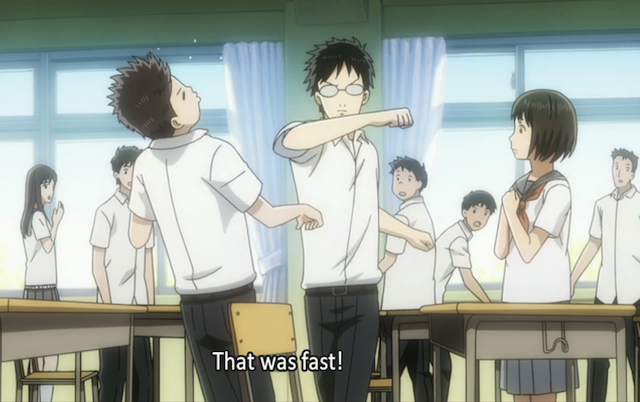 Taichi Mashima and Chihaya Ayase in a dramatic moment at the Nationals. 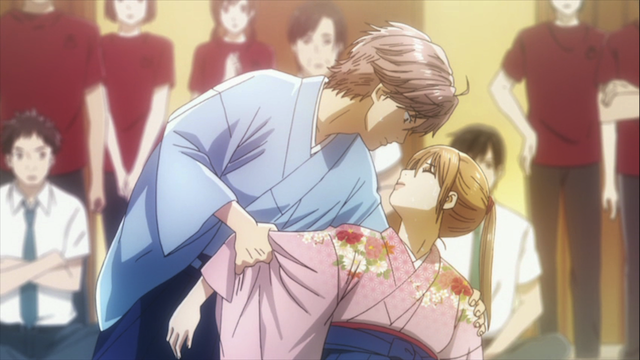 Chihayafuru 13 kicks off the second half of this awesome series. We start right where we left off last time, looking up in awe at the Omi Jungu temple entrance. The National tournament is about to begin. What will happen? Who is this mysterious bishoujo? My guess is that she is the Queen. After a little Shinto ritual, the Karuta club heads to the tournament location, but there is a fateful encounter along the way. I really liked how this was handled. First just as Arata (via flashback voice) was saying “the queen” a young woman appears at the base of the temple steps. 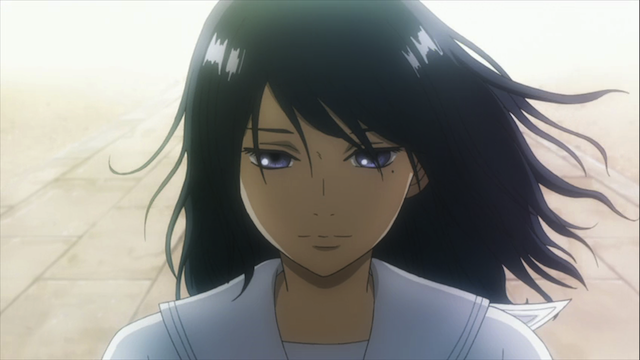 As she walks past Chihaya, there is a flash of light, and things slow down for a moment. After this Chihaya turns around with a look of shock on her face. This is a reference to a convention often seen in samurai movies. The conceit seems to be that great warriors are able to recognize each other. I previously mentioned use of this in my mid-season review of Giant Killing, where I described it as a “shock of recognition”, whereby one warrior senses the warrior spirit emanating from another. The purpose of this device is to build anticipation for an upcoming battle. She looks like a beautiful girl, because she isn't moving or talking. We get into the match pretty quickly, but there is a problem. Chihaya is having difficulty concentrating. Since she complains both that she is too hot and too cold, it seems she is sick. Meanwhile the perspective switches to a character we haven’t seen much of lately. Definitely a different side of Arata Wataya. Arata is heading for the tournament site, so he can watch Chihaya’s team play, but on the way he thinks over the events that caused him to stop playing Karuta. We finally get to see what happened from his perspective. Arata Wataya, on the day his grandfather died. Arata’s sense of guilt makes more sense now. He literally was supposed to be taking care of his grandfather when the old man died. 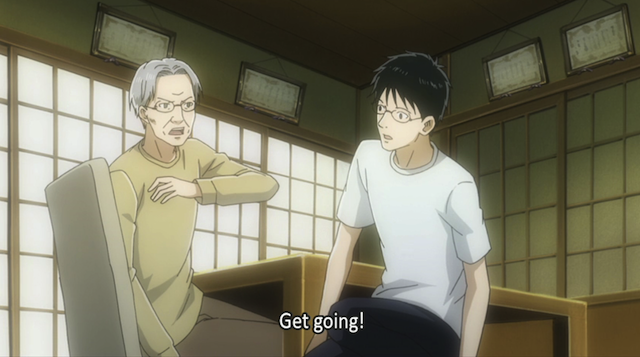 His grandfather realized Arata was supposed to be in a match, however, and sent him off, personally. This can be looked at in at least two ways. On the one hand, going to the match instead of watching over his grandfather probably can be fairly described as a selfish act. Arata wanted to play Karuta, and get the A-rank certification that his classmate had beaten him to. Even if his grandfather understood, it was his responsibility to stay by his side, and he didn’t. On the other hand, his grandfather is dead, and no amount of self-punishment is going to change that. Even setting aside what his grandfather might have wanted for him, Arata is not helping the situation by refusing to play Karuta. All he is really doing is hurting himself. Essentially Arata is wallowing in self-pity. Arata watches over Chihaya while she cries. Arata arrives at the tournament hall in time to see Chihaya collapse. Taichi announces that she has resigned her match, and tries to carry her out, when he sees Arata. 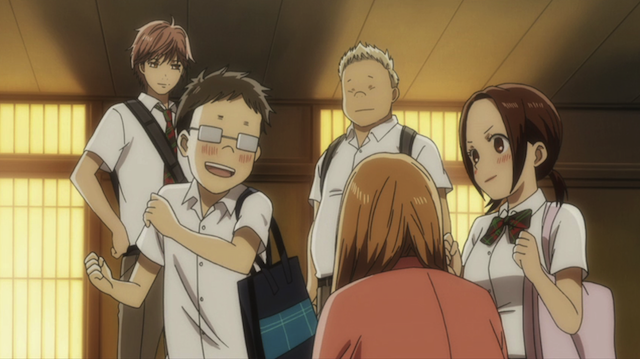 Taichi turns Chihaya over to Arata for safe-keeping. 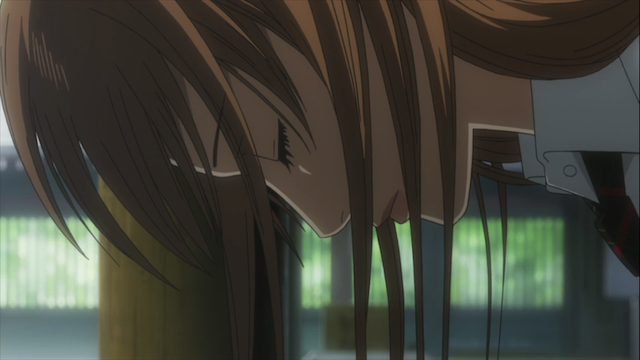 When she finally comes to, Chihaya breaks down as she realizes that without her participation, the team won’t be able to advance very far. She feels bad, not because she doesn’t get to play, but because she has let everybody down. Tsutomu Komano exults in his first victory while the others look on with pride. So a big question was “how far would the team get?”, and now we have that answer: not very. They lost after just a few matches, but it seems to have buoyed Tsutomu’s spirits as he has some victories under his belt at last. Truly there is no shame in having participated in the national championship, even if it is nicer to come home a winner. So where do we go from here? This episode set a couple of things up. First, Arata has returned, and he has made his intention to return to the world of competitive Karuta clear. Second, despite her illness, Chihaya intends to compete in the individual matches to be held the next day. Third, they have foreshadowed, but not yet formally introduced, the reigning Queen. There was some talk, in the aniblogisphere, that the nationals would be stretched out to cover the entire second half of the show. I can’t see that happening now. Further, regardless of how well Chihaya does in the individual match, it doesn’t seem possible for Arata to compete in a match against her (since he was not already signed up). I think it is more likely that the team will return to Tokyo, and work towards a return to Otsu the following year. Bow twice, clap twice, bow once. Chihaya prays at the Omi Jingu shrine. Once again this episode takes a hard left-turn away from expectations. Instead of seeing the team fight it’s way up to the next level (what usually happens in sports stories), the tournament becomes little more than background. 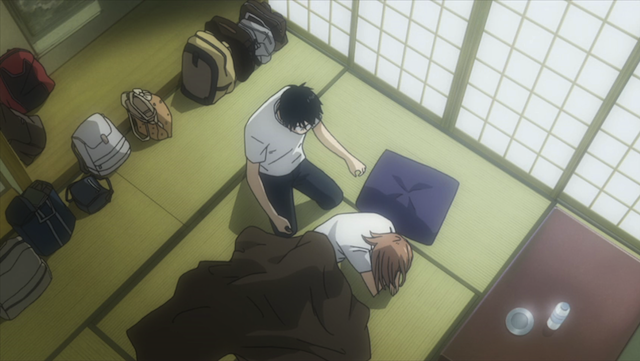 What I found REALLY interesting was Chihaya’s reaction after waking up from her faint. Arata, her inspiration, the person she’s been trying to reconnect with for years, is hovering over her. Does she embrace him? Declare how much she’s missed him? Yell at him for being such a turd? No. There’s a moment of shocked recognition and surprise, and then…she freaks out about missing the tournament and letting her team down. This is terribly revealing about where Chihaya’s head is. And possibly where her heart is…but I’m still working on what that hint means. Yes. I agree. Even though there have been suggestions that Chihaya is in love with Arata, she actually acts more like she wants to play a card game with him. In fact, I would say that most sports anime play up the romantic overtones of a rivalry MORE than Chihayafuru does. Shows like Hikaru no Go (or Cardfight! Vanguard) give the main character a rival that they “chase” on their way to the top. Meanwhile the dialogue is usually very suggestive of a romantic relationship. Instead Chihaya seems to really want to play Arata in a match. Wow, I hope Nationals isn’t stretched out to the rest of the series. But I seriously doubt it will be as well, since this show has been moving pretty steadily (thank God) and it’d be weird to slow down at this point with so many episodes left. I am very interested in the dynamic that will be between Chihaya and the Queen. (Is it just me, or can she and Arata be siblings?) I sincerely hope that it goes beyond the typical sports rivalry, and I am certain that with the good writing we’ve seen so far, it will. 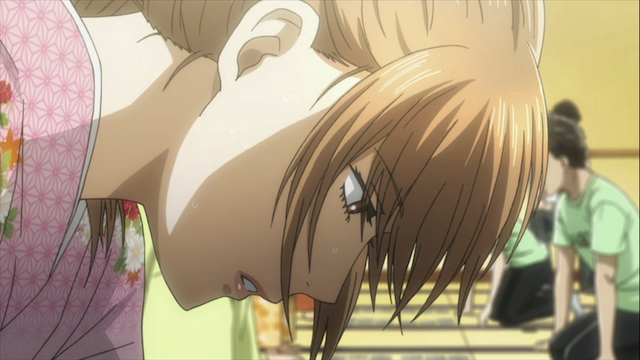 Some shows really stretch individual games out, but we haven’t seen that happen yet for Chihayafuru. They mentioned once that there could be 5 or 6 matches at a tournament, so to stretch this out all the way to the end they would have to either spread individual matches over multiple episodes, or show individual matches for more than one person. Yes, I’m excited to see what happens when the Queen is formally introduced as well. And related, I seem to think it wasn’t until after the “Queen Encounter” that Chihaya started feeling ill. I could be mistaken about that (I’ll have to rewatch)…but if it IS the case — that’s kind of troubling. Well, I assume she was there, but they didn’t even confirm (just hinted) that that girl was the queen. As to when Chihaya got sick, I’m pretty sure the flash of light (that occurred BEFORE the “Queen encounter”) was the first indicator of her illness, so they don’t look related.